This page is to find two presently unknowns, compass error and dish offset value in degrees. If these can be established then less expensive equipment can be purchased or used if you already have it without affecting the setup accuracy. Try these procedures at home in the back garden when you have plenty of time to think and there is no pressure on you to obtain a picture quickly. It really is worth the effort because it will speed up the onsite setup time, sometimes you will obtain a picture the moment all connections have been made and you will feel great. Follow the normal setup procedure, the required compass bearing is say 146°, position wooden pointer, adjust dish until highest signal and best picture quality obtained. You can easily check this if you are using a meter for final adjustment. Stand behind the dish facing the LNB, place a finger at the dish rim firstly at the 3 o'clock position, very gently pull your finger towards you about 1mm while watching the meter, (you are distorting the dish very slightly and sending it off tune), repeat for the 12 o'clock and 9 o'clock positions, if the signal levels drops for each position then the dish is perfectly adjusted. Now realign the pointer to the new dish position, make sure the pointer and the LNB boon are perfectly parallel. 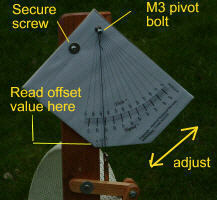 Next remove the dish to a position where its metal parts will not affect any compass reading if placed on the pointer. Reposition the compass very carefully on the pointer without altering the pointer position or if you prefer take a waist or eye level bearing on the pointer. Note this new compass reading, let's say it is now 148° , the difference between the original setup reading on the chart (146°) and the new reading just taken (148°) is the compass error, ie + 2°. Therefore you add 2° degrees to your chart's MagAz figure each time you set up your dish. If the new reading had been 144° then you must subtract 2° from each chart MagAz figure. 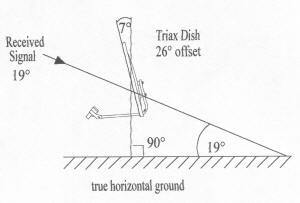 What is Dish Offset ? 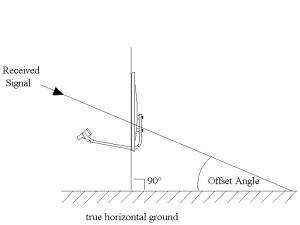 It is the angle of the received signal from the satellite when the dish in the NORMAL is vertical relative to true horizontal ground. Offset dishes for home use are made from a small section of a larger concentric dish. The reason for this is to ensure that the LNB does not obstruct the incoming signal, thus giving a higher signal level input to the receiver (digibox). Typical values are 19° to 26° and are usually published on the dish manufacturer's website. How to find the offset value of your dish. ? This section is only of interest if you wish to setup and have the convenience of an elevation guide. Obtain a perfectly adjusted picture, place the elevation guide on the dish face, make sure both top and bottom rims are being touched by the guide. Slacken the head securing screw (not the M3 pivoting bolt) and adjust the guide head using the plumb line so that the signal angle agrees with the chart elevation figure. Read the offset value using the wooden guide edge that touches the rim as the reference point for the chart.